Photocopiers, printers, and scanners are available at each library location. Microform reader-printers are available at the Harriet Irving Library and the Hans W. Klohn Commons. For location-specific policies and additional information, select from among the library links below. 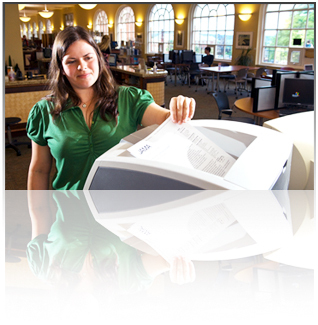 Photocopying is available using UCard cash at each of the Fredericton campus libraries. You may also wish to examine Copyright at UNB and any copyright notices posted near the photocopiers, scanners, and printers. You need to have money on your UCard (UNB/STU photo ID) to print or photocopy on campus. To check your UCard balance, go to UCard Online (accessed through your myUNB Portal), the HIL PHIL station, or the UCard Office in the UNB Student Union Building. Learn how to deposit money on your UCard. For information on printing from personal laptops, visit the ITS website. The HIL photocopier is located on the first floor, outside the Reading Room (room 109). The photocopier accepts UCards only. Printing from personal laptops, library laptops, and most computers in the Learning Commons use the print credit system. Colour printing, and double-sided printing is available in the Learning Commons through the print credit system. A self-service scanner is available in the Learning Commons at no charge. Microform printer-readers are available in the Microforms Dept. in the basement of HIL. The Science and Forestry Library has a public use photocopier. The photocopier accepts UCards only. Double-sided copying is available with charges applied for each side. Printing from personal laptops and library laptops uses the print credit system. The Science & Forestry Library offers double-sided colour printing. A self-service scanner is available at no charge. The Engineering & Computer Science Library has a public use photocopier. The photocopier accepts UCards only. Double-side copying is available. Charges for each side are applied. Printing from library-owned or personal laptops and from general purpose computers uses the Print Credit system. Multi-function machines that can be used to photocopy, print, or scan are available on the First Floor and Second Floor of the Hans W. Klohn Commons. An additional printer is also available on the First Floor. Print credits and a UCard are needed to pay for photocopies and for printing. Prices are shown above. There is no charge for scanning. Library staff can print full-colour posters for UNB faculty, staff, and students. Posters are printed on a paper roll that is 40 inches wide. For each inch of length used, the cost is 50 cents, +HST. For example, a poster that is 40 in. x 20 in. would cost $10 +HST, and a poster that is 40 in. x 60 in. would cost $30 +HST. Payment must be made with cash, credit/debit card, or cheque at the Hans W. Klohn Commons. Faculty and staff can also pay with a UNB account transfer. The poster must be sent in PDF format to hwkcinfo@unb.ca at least 3 days in advance of pickup.